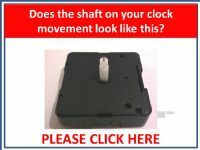 1, What is the length of the shaft in MM, this will be the measurement of the shaft where it exits the middle of the movement to its tip. 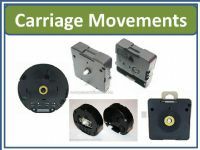 there are generally 4-6 basic sizes of movement available and your movement will generally fall into one of the sizes available between 9-31mm in length, if you movement is an odd measurement then the way round it is to simply go for the longer length shaft thats as close to your required measurement and put a spacer in between the movement and clock dial to give the required length you need. 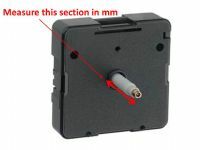 2, What is the shaft type? 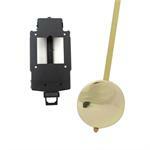 There are a few different types of shaft available the most common being euroshaft or non euroshaft (roundshaft). 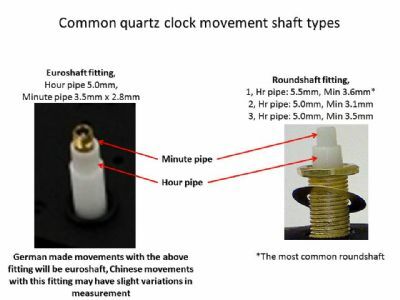 simply put if the minute hand has a slotted rectangular shaft and is held on the shaft by a small nut then it is more than likely a euroshaft movement the measurements of a euroshaft will be Hour pipe 5.0mm, Minute pipe 3.5mm x 2.8mm. 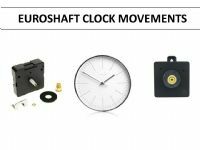 If you find your measurements fall outside of the three listed above please email me on: info@ngclocks.co.uk and upload a picture of the movement with the shaft and the back of the movement and we wil try to point you in the right direction. 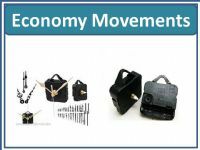 This page will be updated regularly and new links added to assist you in finding the correct movement first time.